Theon Cross strides confidently forth from his crucial role alongside Shabaka Hutchings in the award-winning Sons Of Kemet to unleash one of the vital sounds of 2019. 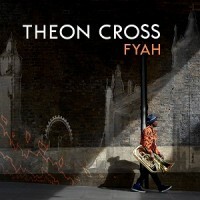 Irresistibly inventive, while at once both serious and witty - Theon Cross plays Tuba like no-one else. An enormous, swaggering bass emanates from his magnificent horn, evoking sweaty clubnights where dance floor bangers sit side by side with intricate arrangements. Nubya Garcia and Moses Boyd, London’s Jazz golden generation illuminaries, feature heavily. Wayne Francis of Steam Down also guests. Refusing to be shackled by the confines of Jazz, the album draws on London’s vivacious cutural heritage, dipping in and out of grime, afrobeat, electronic, dub, dancehall and Jamaican roots music. Millie says: Theon Cross has been saving this gem for us, after working on other albums from Sons of Kemet and Makaya McCraven. Reaching out to other collaborators like Moses Boyd and Nubiya Garcia, makes Fyah a seamless Jazz album which is just what's needed right now.